Ascot racecourse hosts the Betfred Victoria Cup on Saturday, with a large group of closely matched horses being entered for the race. With last year’s winner, Global Village, not in the running this year, it presents a number of horses a good opportunity to take the title this year. Haaf A Sixpence is currently the horse with the shortest odds, followed by Lightning Cloud and Cape Classic. Despite Betfred being the title sponsor of the event, the best place to have a bet on the 2013 Betfred Victoria Cup is with Bet365.com. The odds below were taken from the site, and you will be able to find the latest race odds there as well. Bet365.com is also offering each-way betting on the race, with which you will receive 1/4 if should your selection place in positions one to five. Haaf A Sixpence has received some attention coming into the race this weekend, though with such a varied field it will be difficult to know where the value is, with, for example Prince Of Johanne, who is at 25/1, seeing some action over the last few days, having seen his price drop from 33s. The Ralph Beckett-trained Haaf A Sixpence won last time out, one of two wins this year. He will have been prepared well for the race. Lightning Cloud has five career victories from 15 starts, but it must be noted that the last of those victories came in 2011, with the grey gelding’s only run this year, in April, being a third place finish. Currently at 16/1, a horse that could attract some attention is Solar Deity. The Irish colt has won four of his six starts this season, placing in the remaining two, and has had a month’s break since his last race. With the four year old enjoying a strong second career season, he would be one to look at, at least for an each-way, if not for the overall. Check out our in-depth race preview here. 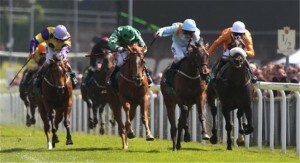 As mentioned above, the best racebook to place a bet on the 2013 Betfred Victoria Cup is Bet365.com, who will offer the best odds on the race. When visiting Bet365.com, click on ‘Horse Racing’ in the left sidebar and scroll down to the Antepost section of the page, where you will find the markets for this race and many more. The Betfred Victoria Cup Race usually has bearing on the Royal Meeting as it is often used as the launch pad to the Royal Hunt Cup, which will be held on Wednesday 19 June. The race is held at Ascot and is run over seven furlongs, horses aged four years old and older eligible to be entered for the race.